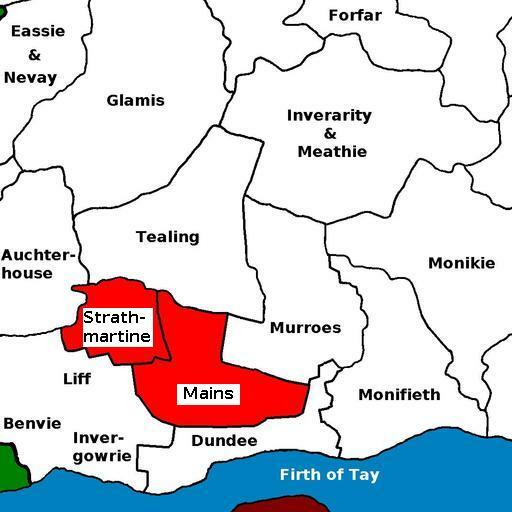 The parishes of Mains and Strathmartine were united on 21 Nov 1792. Anciently, Mains was called Strathdichty Comitis or Earl's Strathdichty; Strathmartine (or Strickmartine) was called Strathdichty Martin. The Dichty Water flows through the parishes. General histories listed on the page for Books about Angus & Kincardineshire, in particular Warden, vol. 4, pp. 272-300. 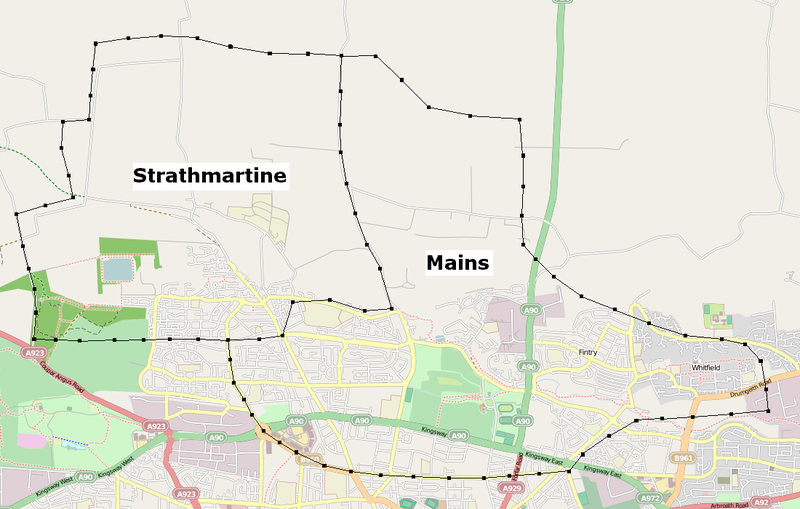 For the full range of maps of Mains & Strathmartine, see National Library's Maps. Not many people seem interested in photographing this area! Photographs of Mains. National Grid ref. NO4132. Photographs of Trottick and Claverhouse. National Grid ref. NO4033. Photographs of Kirkton of Strathmartine - now called Bridgefoot. National Grid ref. NO3735. The ruins of Mains Kirk are at National Grid ref. NO411331, beside Mains Castle. The mediaeval kirk was dedicated to St Ninian and granted to the Abbey of Arbroath by Gillechrist earl of Angus. Strathmartine Kirk, at Kirkton of Strathmartine (now called Bridgefoot), at NO378352, built in 1779, was demolished in 1799. The kirk built after 1799 at Trottick, in the south-east corner of the junction of the Old Glamis Road and Claverhouse Road, at NO402336, served the united parishes of Mains & Strathmartine. David Cannan 1820-1848 b. 1774 Kells KKD, son of James C., farmer; ord. to Kirriemuir 24 Mar 1803; tr. to Murroes 3 Aug 1809; tr. & adm. 16 Nov 1820; D.D. St Andrews 1828; dem. 28 Jun 1848; d. 12 Jul 1854 Edinburgh; M.I. in Dean Cemetery Edinburgh; mar. 1804 Margaret Ouchterlony, dau. of James Lowe, Trinidad; issue: James; Joseph; Mary; Francis Nicoll, min. of Lintrathen; Robt, lieut.-gen. in Turkish service; John, surveyor, Australia; Peter; Helen (mar. James Forgan, writer, Dundee); Thos, planter, Mysore; David; Alexr, capt., H.E.I.C.S. * The Fasti mistakenly list him as being twice married, but Martha Souter and Martha Johnston were the same woman - see Note for Mr John Souter, alias Johnston, of Wardmilne, minister of Barry, Martha's brother. Mains Churchyard [old photo] is close to Mains Castle, within Caird Park, Dundee. Andrew Jervise recorded some monuments at Mains in his "Epitaphs & Inscriptions", vol. 1, pp. 302-3 and at Strathmartine on pp. 204-6 of that volume. Monuments in the surviving, southern part, of Strathmartine Kirkyard bearing pre-1855 information (ca. 40 stones) are listed in Alison Mitchell (ed. ), "Pre-1855 Monumental Inscriptions in Angus, Vol. 3: Environs of Dundee" (Edinburgh: Scottish Genealogy Soc., 1996), which can be bought from the Scottish Genealogy Society. (It's listed as "Angus MI - Vol. 3. Pre-1855 Environs of Dundee" in their online shop.) The northern part has been built over. Original records are held by Dundee City Archives; repertory is available at NRS ref. CH2/23/...; digital images are available on personal visit to NRS. Sir John Ogilvy of Inverquharity, bart. Mains & Strathmartine were in the Commissariot of St Andrews.